Dormers Wells High School has high expectations of students with regard to leadership and encourages all students to become part of the leadership of the school community. This provides opportunities for students across all year groups to develop their skills and to work together to deliver a cohesive, school wide initiative which engages students from Year 7 to 13. 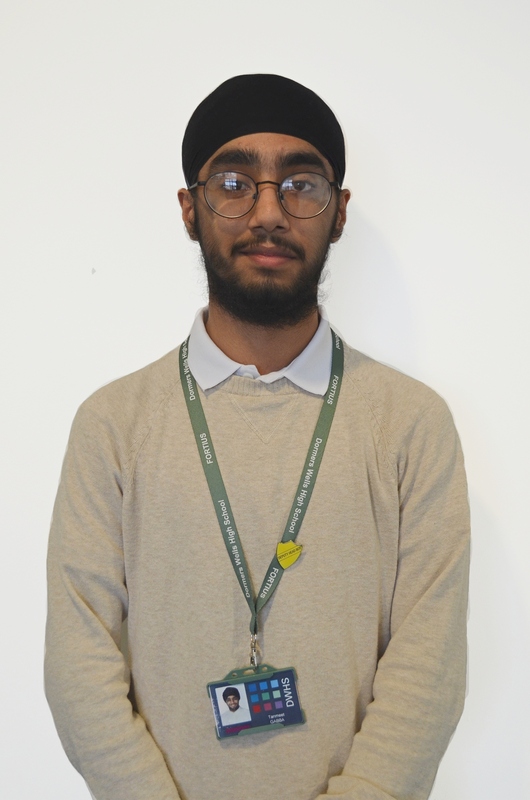 My name is Tanmeet Gabba and I am the Head Boy of Dormers Wells High. I have studied at this school since Year 7 and have had a remarkable experience, as I have met a wide spectrum of people who have different interests and aspirations. Dormers Wells High School has helped me develop a strong backbone of discipline and creative adaptability, as well as broaden my skill set, by offering me a number of extra-curricular activities. The school has allowed me to achieve a Gold Industrial Cadets Award, to partake in Model United Nations, to play a part in multiple drama productions and to represent the school in both football and cricket. I am very fervent about entering a careers in the financial sector; I am particularly interested in the areas of investment and economics and finance. DWHS has allowed me to pursue these passions by offering me the opportunity to partake in the LSE Summer School, which focused on contemporary economic theories such as behavioural economics. I am studying Mathematics, Further Mathematics, and History. With the guidance of the school, I hope to read Mathematics and Economics at university or to secure a Financial Technology apprenticeship. My main pledges are: to offer support to students who are struggling to cope with exam stress, to bestow greater emphasis on the importance of extra-curricular activities and to ensure that every pupil feels confident enough to voice their opinions and to strive for success. I am very grateful to the school for the opportunities that I have been presented with, and I feel very honoured to have been given the role of Head Boy. I will proudly represent our brilliant school and community during my time in this role and will work to the best of my abilities with the leadership team to ensure that our school continues to progress positively. My name is Harmanpreet Takhar and I am Head girl at Dormers Wells High School. I am in Year 12 and I am studying A level Physics, Maths and R.E. I intend to read Aerospace Engineering at University, and I desire to have a career in engineering in the future, perhaps with spacecraft. Despite originally finding Physics a difficult subject, I became more motivated as a learner with the guidance and support of my teachers. Subsequently, I attained very good GCSE results in Physics and am now very excited about developing a career in this sector in the future. To both develop my academic portfolio and skills and to have fun, I have attended many extra-curricular activities including Debate mate, United Nations mock conference. I have volunteered at a fashion show and even taken part in the National Citizen Service last summer. These various activities have really helped to build my self-confidence and social skills. I have exceeded beyond my own expectations as through these activities I have gained skills which will remain with me for a lifetime, such as speaking confidently in public. 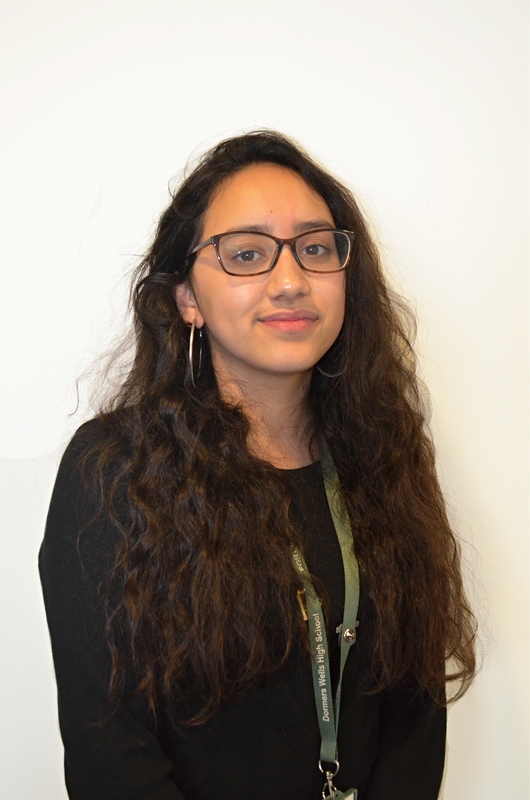 Alongside being Head girl, I am also a Fortius House Leader and my aim is to work alongside my house captains to motivate students to take part in school activities and gain house points. I have always been an extremely sporty individual and since the start of Year 7, I have been involved in many sports teams such as netball, basketball and rounders. I even participated at Perivale athletics and took part in two Cancer Research races. I have continued my enthusiasm for sports into the Sixth Form, as I take part in a physical education session every fortnight. Moreover, I will be taking part in the Duke of Edinburgh award this summer, which I believe will teach me key survival and teamwork skills. Becoming Head girl was not something I had ever imagined would come true, but I am extremely glad I was chosen as this role has really enabled me to realise what responsibility really means. Working alongside the Head teacher’s Ambassadors we have come up with different ideas in order to help our school progress further efficiently. We are currently working with a charity in Ealing to raise money which will provide resources to the homeless, on the streets of London. This idea was initiated by the Head boy and together we have generated ideas to raise money such as a sponsored silence to support this cause. We hope to inspire younger students to help in their communities with our work. To conclude, I feel very proud that I have been chosen to represent Dormers Wells High School and I look forward to working alongside Head boy and the Head teacher’s Ambassadors in improving our school further. (From Left to Right) Soruban Vigneswaran, Alishba Siddique, Hamdi Dalmar, Hamza Nur, Harnit Palra, Farhia Mustafa, Harpreet Katar, Satbir Matharu, Honey Pandya, Tanmeet Gabba, Harmanpreet Takhar, Jasmine Sanghera, Avleen Kalra and Joanna Sawicka. The Head teacher’s ambassadors work closely with the Head teacher, Senior Leadership Team and Sixth Form Team alongside the Head boy and Head girl. Their roles include representing the school at events and forming part of the Executive Council that feedback student issues or queries to the Head teacher. 8 students are elected from each year group Year 7-11 to form the Year Council. All students are placed in a House. Opportunities exist to become part of the House Leadership Team with positions of House Captain, Deputy House Captain, House Sports Captain and Deputy Sports Captain. House Leadership roles have a key position in running the houses, house activities and leading assemblies. To raise awareness of leadership as a skill for all. Engage all students in the wider school community. To organise and run these aspects of school life with a limited staff involvement. To foster wider leadership roles. To enable students from every year group to engage in a wide range of House competitions. To create a supportive community. Develop the roles and responsibilities within Year 11 with specific jobs and job descriptions.